If you were to turn the page to the announcements section of The Daily Prophet’s latest issue, you would quickly discover that the Wizarding World’s favorite Muggle-born bookworm, Hermione Granger, celebrated her 39th birthday this week- on September 19th, to be exact. Generally regarded as one of the most talented witches of her time, Hermione has never been the type to let her bushy brown hair down and parade around in a party hat on the regular, especially in the years that she attended the Hogwarts School of Witchcraft and Wizardry. Back then, the straight-A student was too busy dropping knowledge bombs and demonstrating the perfect swish and flick for the “Wing-GAR-dium Levi-O-sa” charm, all while saving her best friends Harry and Ron from a number of potentially dangerous situations. Our hearts expanded to the size of the pumpkins in Hagrid’s vegetable patch the moment that Hermione tore up the rulebook in favor of Ron’s happiness at one plot-twisting point during their sixth year at Hogwarts. At Quidditch keeper try-outs, Hermione outplayed Cormac McLaggen from the comfort of the pitch stands by casting a Confundus charm over the self-assured sportsman. Consequently, he missed the ball and Ron swooped in on his broomstick to take his rightful place on the Gryffindor team. Hermione achieved the ultimate glow-up when she switched out her perfectly pressed robes for a show-stopping gown in preparation of the Yule Ball on Christmas Day. By this stage in the Harry Potter series, a whole pack of Potterheads were shipping Romione, but sadly, this ship sailed further into the distance after Ron failed to ask Hermione to join him at the end-of-year event. Instead, she made her head-turning entrance into the Great Hall with Viktor Krum, the swoon-worthy Triwizard champion who Ron idolized, and for good reason too. Hermione was arguably the most intelligent student in her year, year after year, much to the annoyance of her other classmates who could never seem to beat her in the race to raise their hands to answer questions. During their first year at Hogwarts, she used her knowledge from Herbology class to free her friends from the Devil’s snare, a plant with magical properties that tried to crush Hermione, Harry, and Ron after they dropped through a trapdoor straight into the florist’s worst nightmare. Under pressure, the young witch recognized the vicious vines and relaxed to escape their vice-like grip. Hermione then summoned the bluebell flames to save Ron, who was the last remaining victim. Perhaps it’s time she invested in some shining armor? The Chamber of Secrets was opened twice, once during Hermione’s second year at school and exactly fifty years prior, both times releasing the Salazar Slytherin’s Basilisk into Hogwarts. Before Hermione fell out of action from petrification, she identified the serpent that was traveling around the school’s pipes system and subsequently saved herself and another student from death. Using a mirror to navigate her way out of the library, she managed to avoid direct eye contact with the monster, which left her in a less permanent paralyzed state. 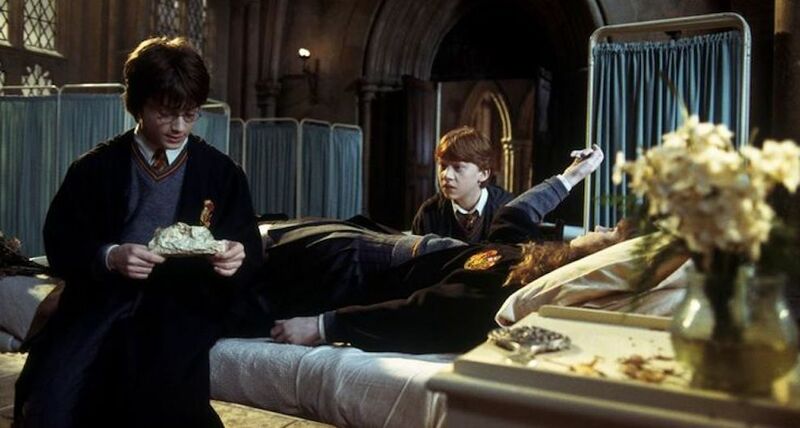 Even in her unconscious condition, Hermione managed to leave Harry and Ron the information required to solve the mystery, by way of a piece of paper that she held in her hand. In their second year, Hermione, Harry, and Ron swapped out their usual Butterbeer beverages for three steaming goblets of Polyjuice Potion as they worked together to trick Draco Malfoy into revealing whether or not he was the heir of Slytherin. 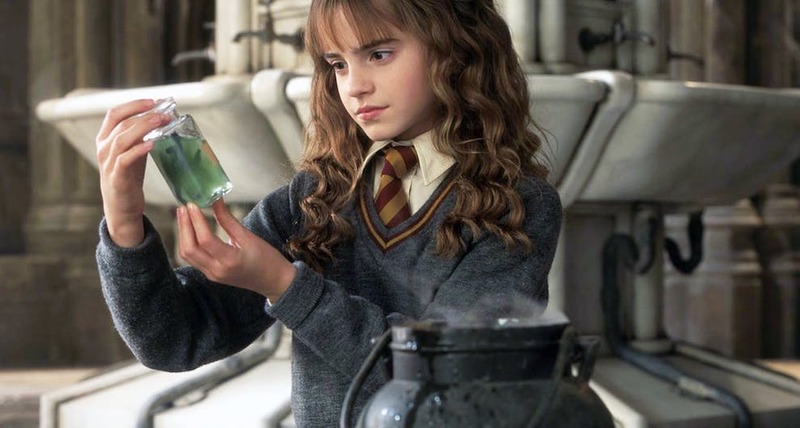 We have to (once again) give major props to Hermione for this one because the super-advanced Polyjuice Potion is a notoriously difficult concoction that takes a whole month to brew, which is the reason that it’s better left to only the most highly skilled witches and wizards. However, Hermione successfully produced the mixture in time for Harry and Ron to temporarily transform into Draco’s dim-witted sidekicks, Crabbe and Goyle. Sadly, a mix-up with cat hair caused Hermione to develop a pair of furry ears and a fluffy tail, which prevented her from sneaking into the Slytherin dungeons with the portly pair. Still, we would say it was worth the toil and trouble! 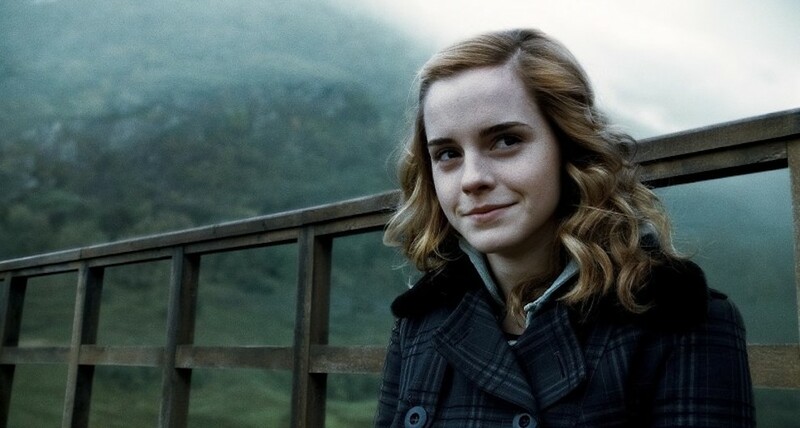 During her fifth year at Hogwarts, Hermione helped to organize Dumbledore’s Army by enlisting students, arranging secret meetings, and strongly encouraging Harry to take on a mentoring role. Even though Harry ended up leading the secret organization, it was Hermione’s brainchild from the start. After Professor Dolores Umbridge restricted students from using magic in lessons, Hermione realized it was time to break the rules and form an underground society as she recognized the importance of learning defensive magical skills, especially with the increasingly ominous threat of Lord Voldemort’s return. Throughout all of this, the golden trio were fighting the good fight and taking no prisoners while serving up the ultimate squad goals. Seriously, where do we sign up? In possibly one of the most touching moments of the series, Hermione offered Harry her proverbial shoulder to cry on when they found themselves at the graveside of his parents, James and Lily. As part of their search for Horcruxes, Harry and Hermione dropped into Godric’s Hollow, where they made a detour to St Jerome’s graveyard where the Potter parents were buried. Understanding his needs, Hermione emotionally supported Harry and stayed silently by his side in the snow-covered scene. She even created a beautiful flower wreath for the two headstones before the pair were forced to return to their original quest. Pass us the tissues, please. Another scene that hit us right in the feels was the moment that Hermione had to make the ultimate sacrifice and put her own needs second to ensure the safety of others. Motivated by love, Hermione bravely performed a memory charm on her Muggle parents in order to protect them throughout the Wizarding War. She used the spell to erase herself from family photographs, alter both of her parents’ memories, and give them all-new identities. Not knowing whether she would ever really see them again, this act of pure selflessness further highlights Hermione’s strength of character and logical approach to extreme challenges. Now can someone Obliviate this part from our minds? 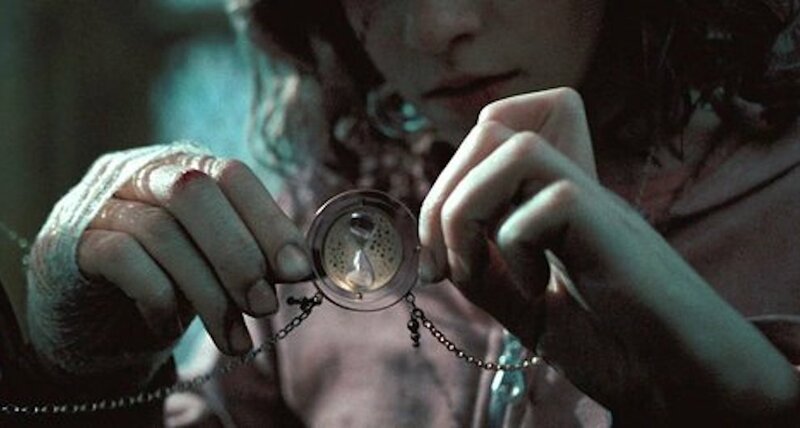 In Prisoner of Azkaban, Hermione was granted permission to become a Time Lord when Professor McGonagall handed her a very special gift that allowed her to attend more classes to maintain a flawless academic record- a Time-Turner. During the same year, Hermione used the Time-Turner to travel to the past and save a few lives. By turning the small hourglass on the device three times, she was immediately transported back in time by three hours. In this timeframe, she and Harry were able to save Sirius Black from the Dementor’s Kiss (which is not nearly as romantic as it sounds) and rescue Buckbeak from his scheduled execution. We solemnly swear that this is Hermione’s greatest moment in the Harry Potter series, mainly because viewers were given the opportunity to live vicariously through her character in the best possible way. Let’s face it; we have all wanted to stick one on Draco Malfoy at one point or another. The pureblood wizard was particularly insufferable in the early years, constantly antagonizing any students in opposing houses. So when Hermione witnessed Draco and his posse laughing over Buckbeak’s beheading in Prisoner of Azkaban, she finally gave him the punch in the face that he so deserved. 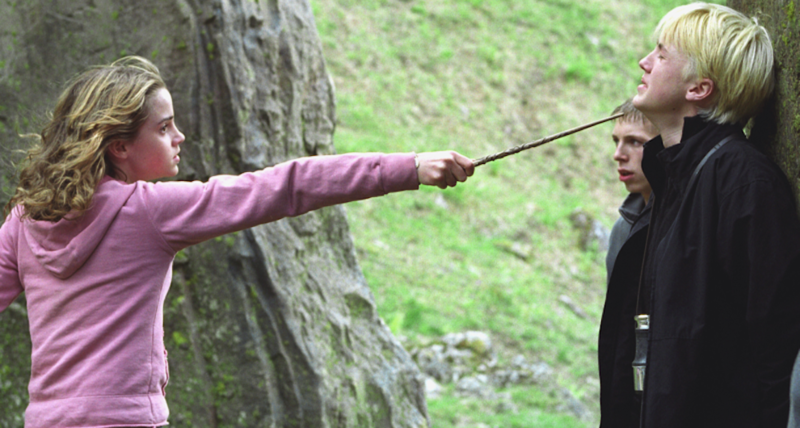 What’s your favorite magical moment in Hermione’s history? Think we missed something important? Let Your Geek Sideshow and tell us in the comments!